Since the early 80s, we all witnessed the early steps in video game programming, together with the advent of home computers and their progressive invasion in nearly every home. 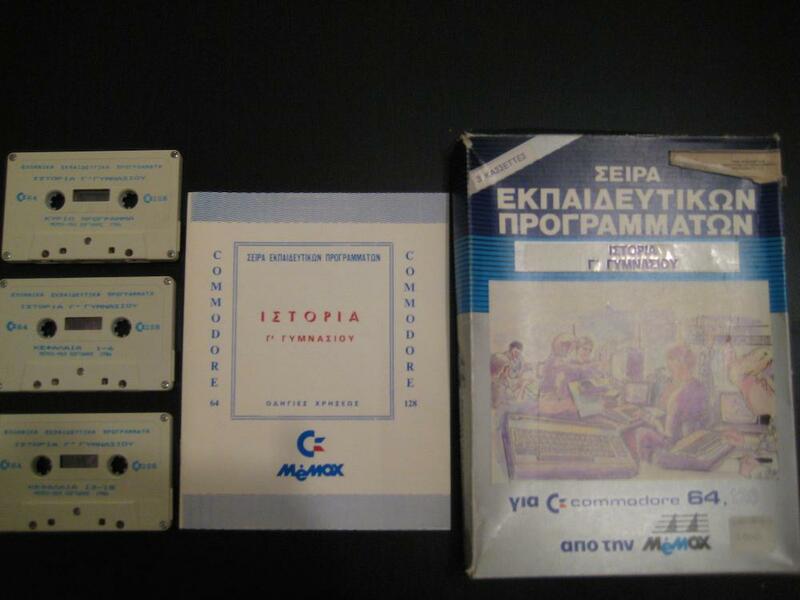 The first Greek software houses, following this spate of home video games, took their first tentative steps in this new environment. 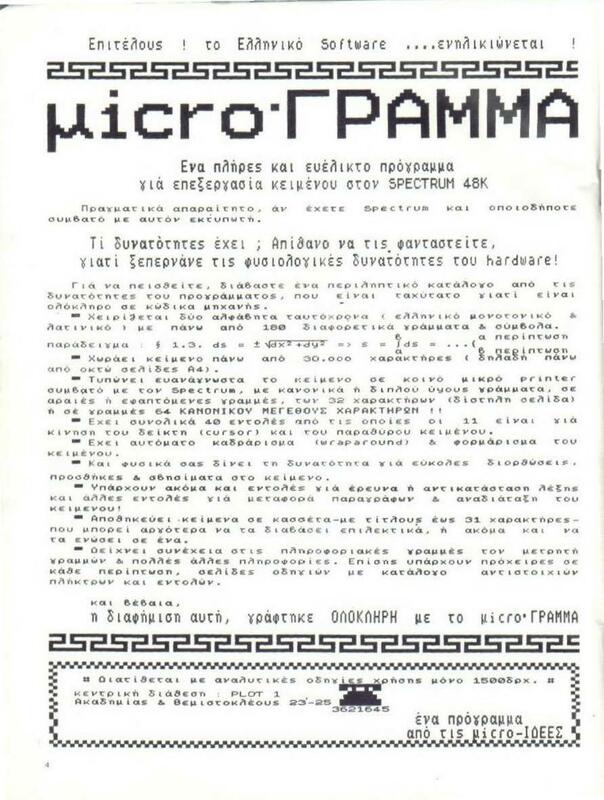 This leaded to the establishment of some Greek companies, full of passion and vision, to reclaim a small share of the profits from the 8bit gaming world. Some indicative companies in this area, as we read on our national computer press like: Pixel, Micromad, Sprite, etc were Acocsoft, Cosmon Software, PIM, m-ideas and Civildata. Some of these companies were exclusively involved with gaming titles (like Acocsoft), others with some applications and educational programs development (such as PIM) and some with both (such as Cosmon Software). Less known to ordinary users of 8bit home computers, were companies such as m-ideas and Civildata which dealt with the development of commercial applications for businesses, accountancy and engineers. 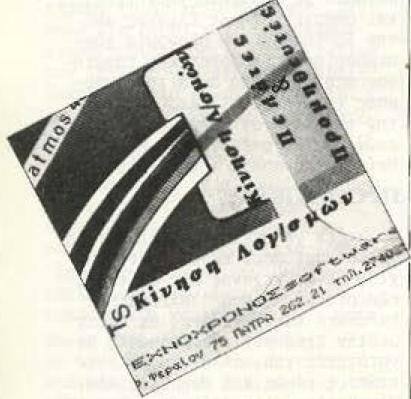 It is very important to mention that software houses did not dealt exclusively in this production process and development of Greek software but also with the specialized computer press as well. Thus large publishers such as COMPUPRESS developed a number of programs and applications for 8bit home computers (with the contribution of some freelancer developers). 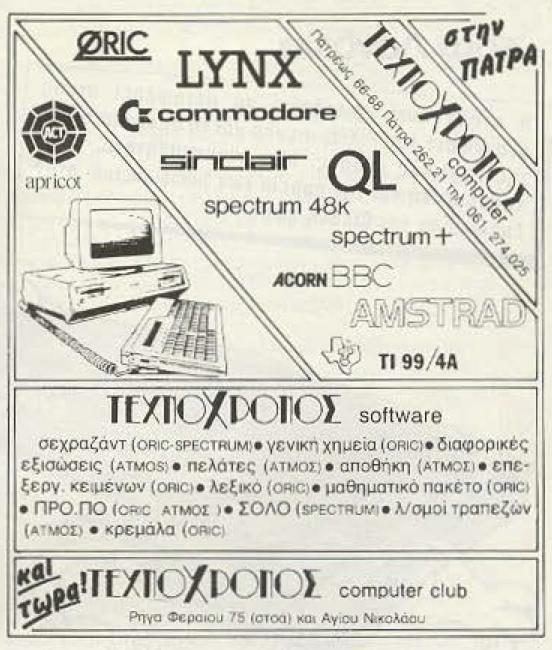 In the next pages, we will take a brief look of some of the best known Greek IT companies involved in the 8bit generation which experienced commercial success in ’80s and ’90s, as well as to some individual people who were programmers and creators, working for these companies. COSMON SOFTWARE, subsidiary company of COSMON Ltd. is a Greek software house which started its course sometime around 1985. 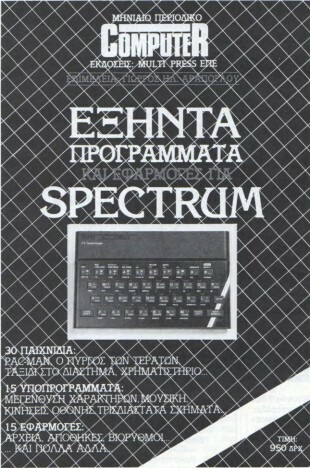 It begun with the development of games and commercial applications for 8bit home computers (Spectrum, Amstrad) and later on proceeded to develop compatible programs for the IBM PC . Their productions were not limited to that. They had a special development department for custom applications, depending on the needs of each individual client (Custom home made Software). KOSMON ltd (as it is called today) develops applications for Call centres and provides telecommunications equipment. 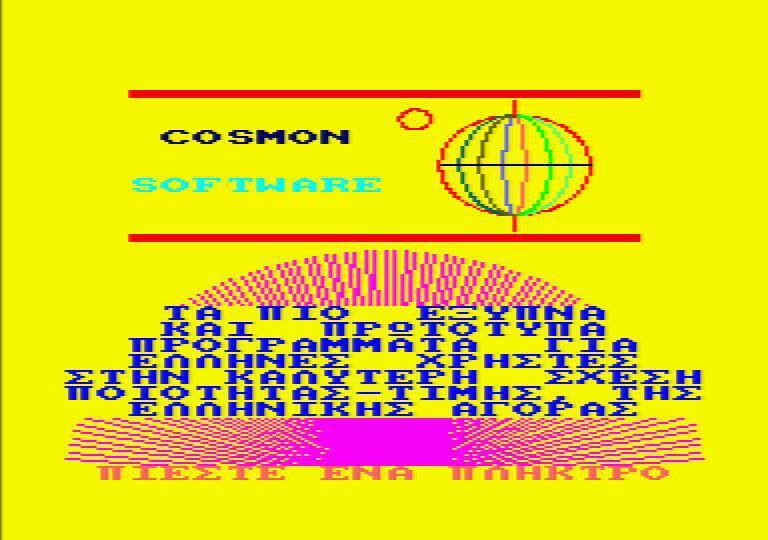 The main advantage of applications and games developed from COSMON was that the user had access to the source code. This means that all programs were unlocked. This is something extremely educational and functional for an apprentice programmer. In addition, there were commands to the listing of the program, like REM (remarks and comments) for explaining the function of each routine (Procedure / Function). 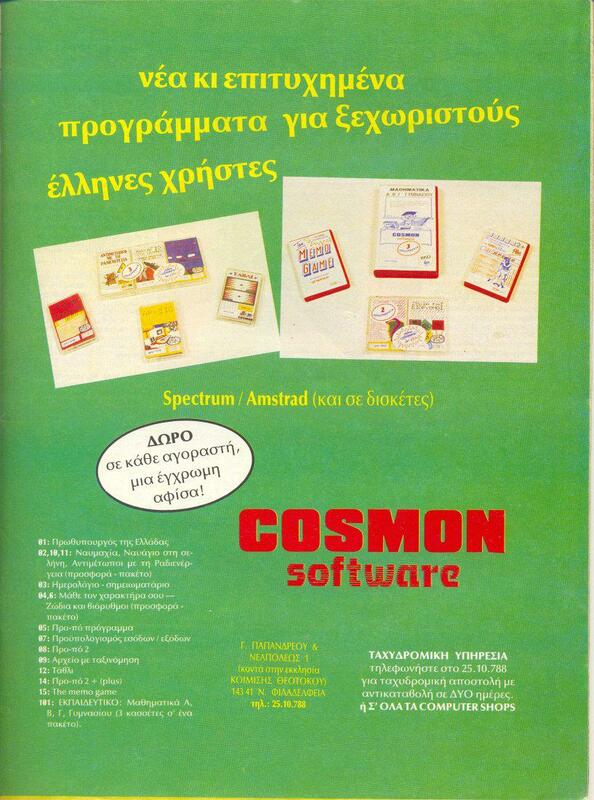 Another feature of COSMON was the very high quality of tapes they were using as media. Cassettes with metal reels, which were a feature the company liked to advertise. These metal reels protected the tape and consequently all data from other magnetic emissions. A high quality manufactured cassette was not something that buyers could find very often on the market. Wether in domestic or even imported releases. Each program was accompanied by detailed instructions. These were not limited only in the way of loading and running each program, but they fully explained in deep information about the way to use it. There where programs such as “FILE” (or ‘archive’) and “PRO-PO“, accompanied with some demo-type program instructions, like a quick guide. 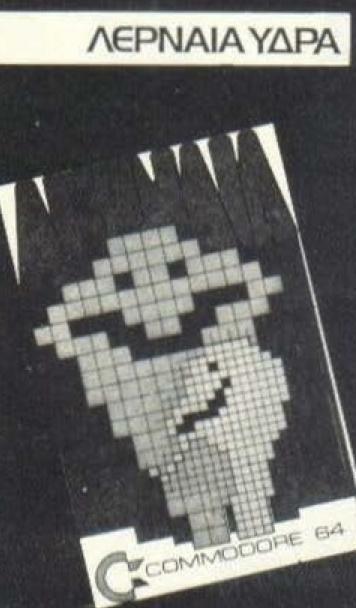 Company’s chief programmer, the one who developed many games and programs on the 8bit platforms was Mr. George El. Arapoglou. We see very often his name to be featured whenever we come upon the list command in COSMON Software programs, either on Amstrad or Spectrum. 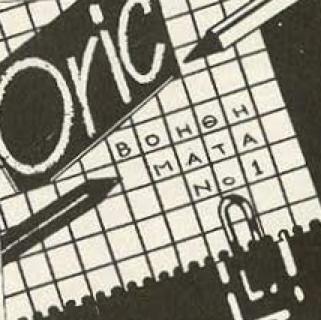 His name is inextricably linked with MICROMAD magazine. He started his career as an editor in chief, in first issues and then became production manager and managing editor of the magazine. As a programmer he has additionally published two books for ZX Spectrum and Amstrad with 60 integrated programs in each of them. ACOCSOFT was a company that was not from the beginning a nascent software house. 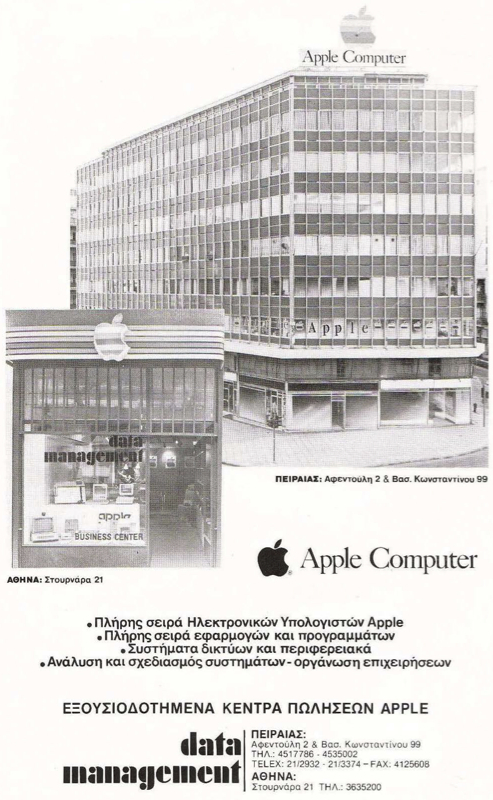 The founder Kostas B. Konstantopoulos, an architect by profession, together with his technical office, decided in May 1985 to start at Halandri area, his first computer shop named ACOC. In 1986, ACOC except marketing computers started making specialized programs for architects and engineers. Apart for the development and production programs for the home micros (for Amstrad 464 and 6128 at the beginning) another bright idea was born…An idea which leaded to the making of custom tailored programs on behalf of clients who were into construction business as long as spreadsheets, file applications and tax and receipts programs for stores. In early 1987, ACOCSOFT dared to enter into the field of game’s development. A field where the competition was very stiff from foreign game companies. 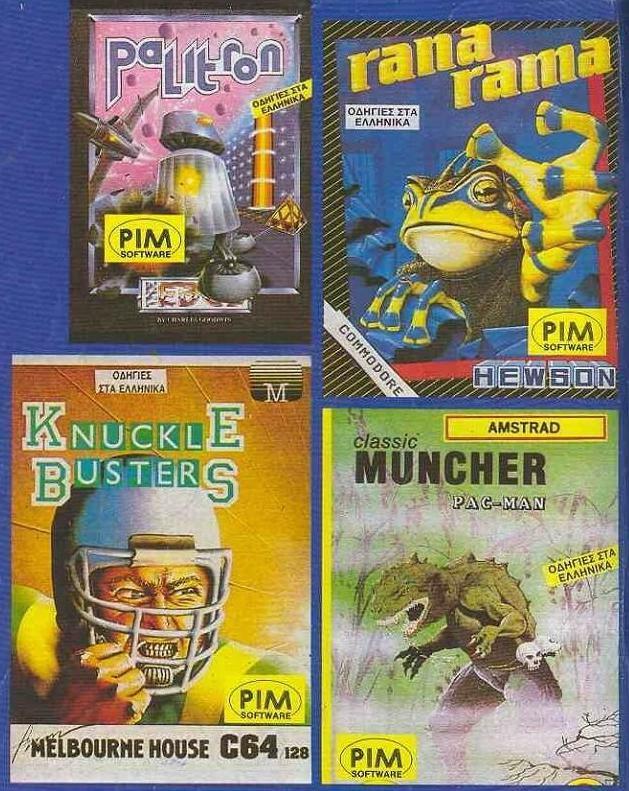 Company started to make games for Amstrad, then later for Spectrum and Commodore. ACOCSOFT didn’t employ a permanent game development team. They had a core of 4 full time job employs and also used to work in cooperation with freelancers, who were young people aged from 15 to 25 years old. 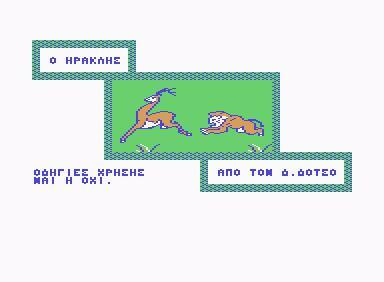 The most representative of them, we find very often their names in introductory screens of games were Ioannis Ginis, Nikos Glykos, George Xilomenos and Nikos Egglezos. Vasilis Terzopoulos developed the ‘locking’ code in games, while Peter Vlachoutsakos designed all the box artworks and advertising posters. He is a well known comic artist in Greece. When a game from a freelancer developer arrived in ACOCSOFT, there was a procedure it had to pass through. There were some retouching stages, i.e. sprite modifications, graphics and colours (except scenario) redesign, addition of introductory screens, code optimization for speed and in final stage the beta testing to discover potential bugs. Another original feature of ACOCSOFT releases, was the humorous factor. This is why during the game play, there are some mischievous / slang phrases as “mas koufanes megale” or “the flies will eat us all” etc…. It is noteworthy to say that at the beginning, ACOCSOFT encountered a problem on the distribution of its games. 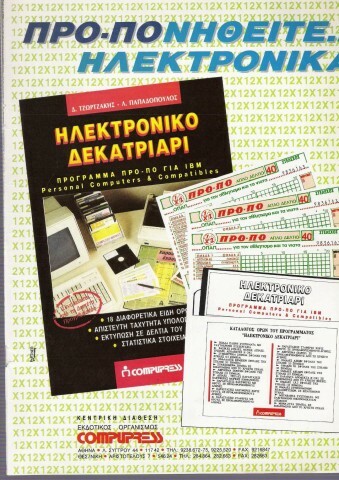 The reason was that most of the existed computer shops dealt with Greek gaming software with caution and coldness, avoiding promoting it and so the delivery was managed in a ‘door to door’ base by the company’s own employees and only to the clients who ordered them by phone or mail. ACOCSOFT is a Greek software house, evolved and matured through the IT market. This is very obvious from the quality of games, from early to later productions. The graphics in games became over time more detailed and colourful. A typical example of this contrast, we can notice in comparison of two game titles: “The Fly” and “The Wall“. 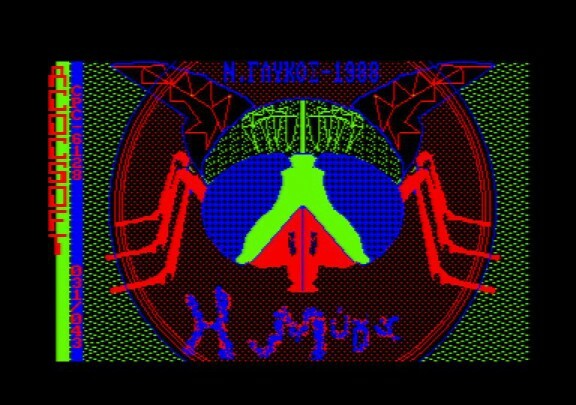 In “The Fly“, graphics and script are both very simple. Collision detection was a bit unrelated and unconnected with sprites motion, while in the second game; “The Wall” we have colourful graphics and script quality both able to compete into equal with games from foreign developers. 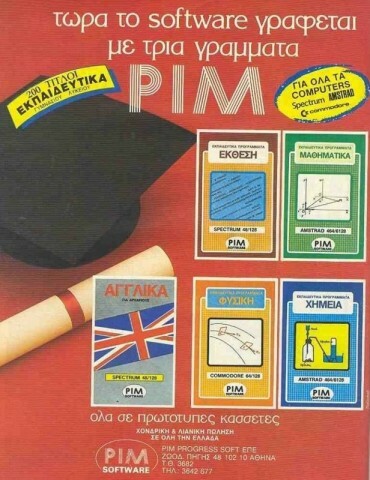 With a smaller footprint in Greek IT market, comes PIM Software. Comparing with the previous companies, we have to say that it met a warmer sales’ support by a few more computer shops. Every potential customer could see some of “PIM Software” titles, well placed on front of the biggest shops at Stournari street in Athens, which was the so called “Greek Silicon Valley” back in the days of ’80s. The company’s name, PIM as pronounced, resulting from the original “Pedagogical Institute of Microcomputers” and its success (albeit small), was based on the fact that it came to fill the software related gap in to the Greek secondary level of education. PIM’s president was Mr. George Despotis. They developed programs that were only educational and based on known levels and the current material of each class. Besides educational programs, PIM has developed “HERACLES” (Hercules), a text-adventure game for Commodore 64, based on Greek mythology. 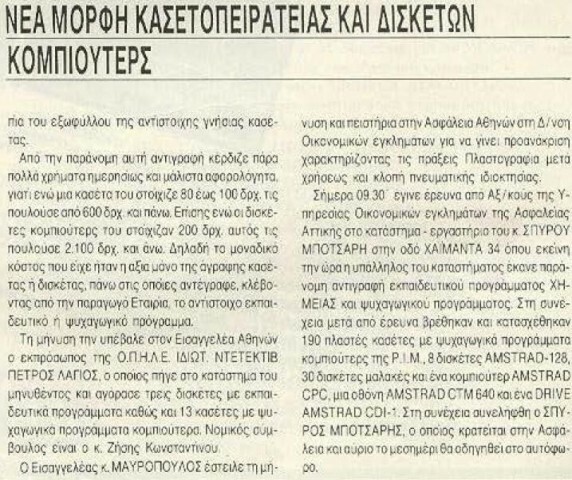 Developer was Mr. Dimitris Dotsos. PIM Software knew a lot of publicity for two more reasons. 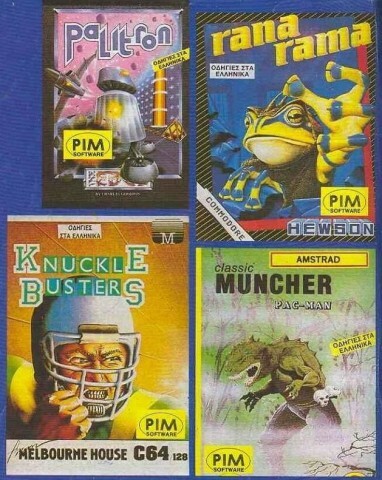 The second reason was that PIM had the legal rights to be the representative and official distributor of foreign software houses (Melbourne House, HEWSON etc…). 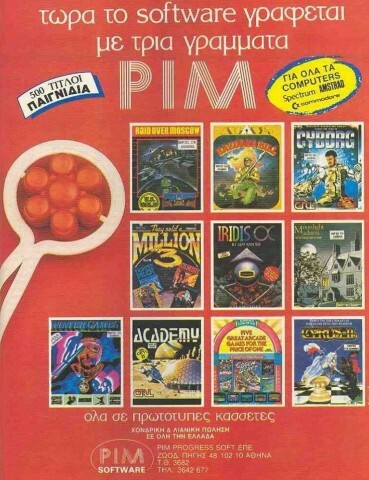 PIM distributed their games with translated manuals in Greek language. MEMOX launched in 1984 to promote exclusively Commodore computers. 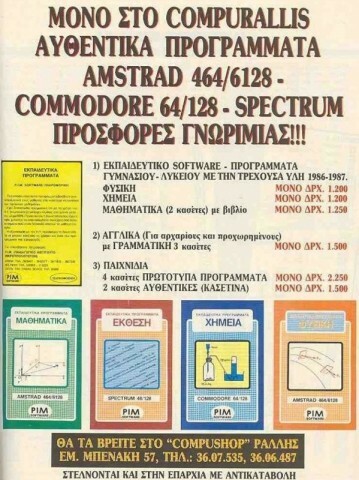 It was Commodore’s official representative in Greece. 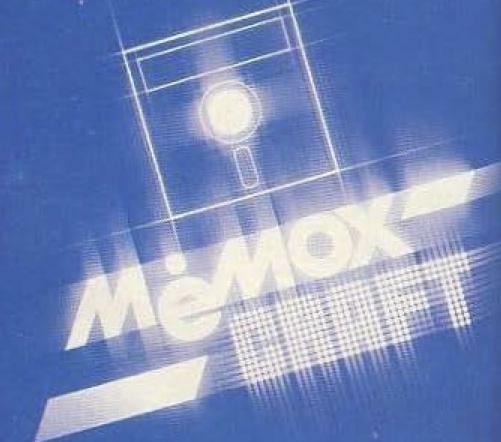 MEMOX’s dynamic presence lasted for several years with sales upwards to the top by the end of 1992. That was the year MEMOX ran out of business and all the company’s assets and property were redistributed. Its activities covered C64, C128, Amiga even Commodore PCs, as well as their peripherals. Hardware service but also software development was achieved through the company’s subsidiary software house of MEMOXCRAFT and also from Commodore Club. 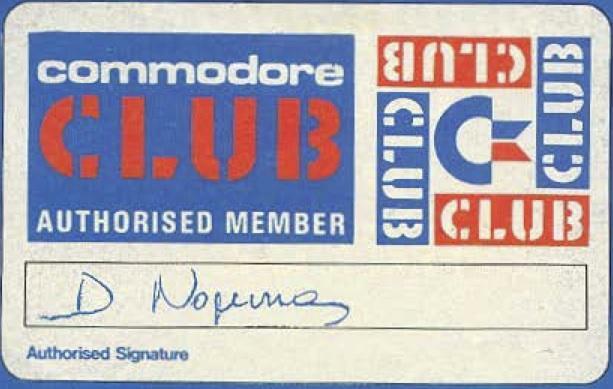 MEMOXCRAFT launched about the same time with MEMOX, but Commodore Club was founded a year later, to give support to Commodore users and also to potential buyers by allowing and encouraging the practical use of numerous Commodore computers with the special bonus of availability of many original games to try on and play with! Commodore Club head staff organized Commodore Computer Camps with plenty of educational seminars (in Assembly, Basic and other programming languages but also in UNIX and DOS), and lectures given by trained instructors and teachers. They permitted free use of Commodore computers and programs taken out from a vast, lending library. They also were into developing and use of educational programs. Finally they also ran a miniature memorabilia market selling stickers, posters, t-shirts and various consumables. Diamantoryxos. 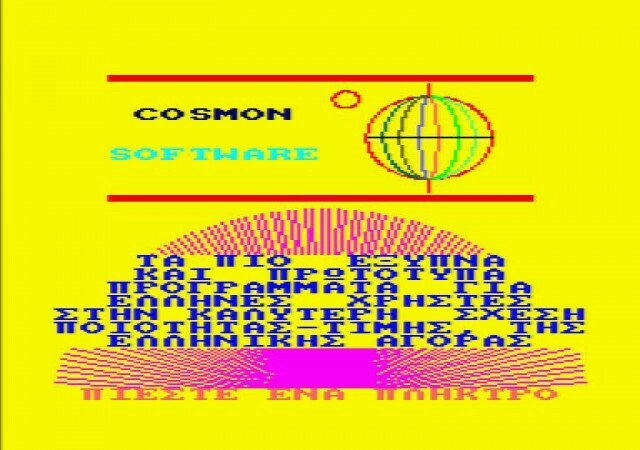 This is a C64 game programmed by Mr. Sotos Demetriou in 1982 as a final year student in Seattle (US) and released in 1984. 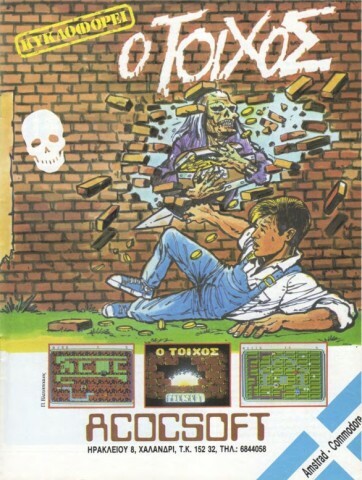 According to its respective programmer, this particular game was written on paper while waiting to receive his own C64 computer, which was a part of a group order that was delayed for 6 months. Lernean Hydra. 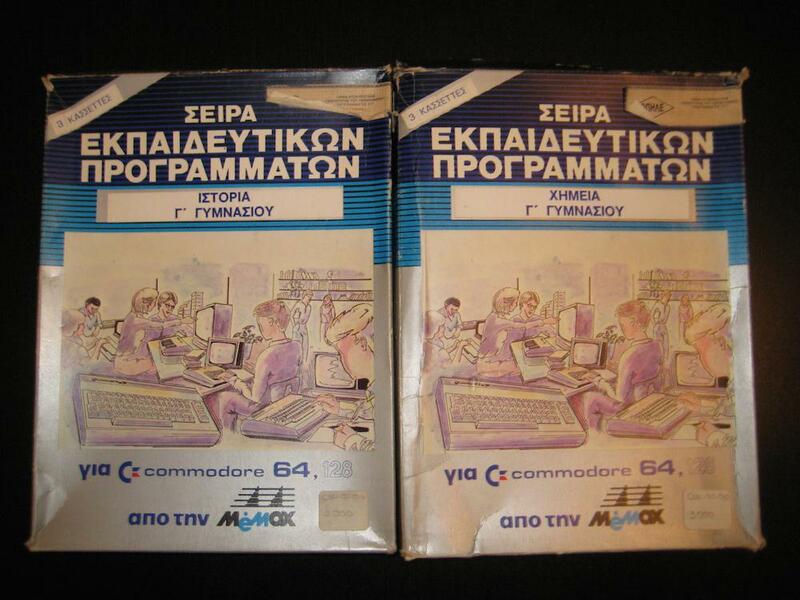 Another C64 game programmed by Mr Sotos Demetriou in 1983 when he came back to Greece from US, also released in 1984. The series of educational packages of school aids from MEMOX (MEMOXCRAFT) for high school classes were also remarkable. These titles covered the courses of mathematics, chemistry, history, physics and geography. 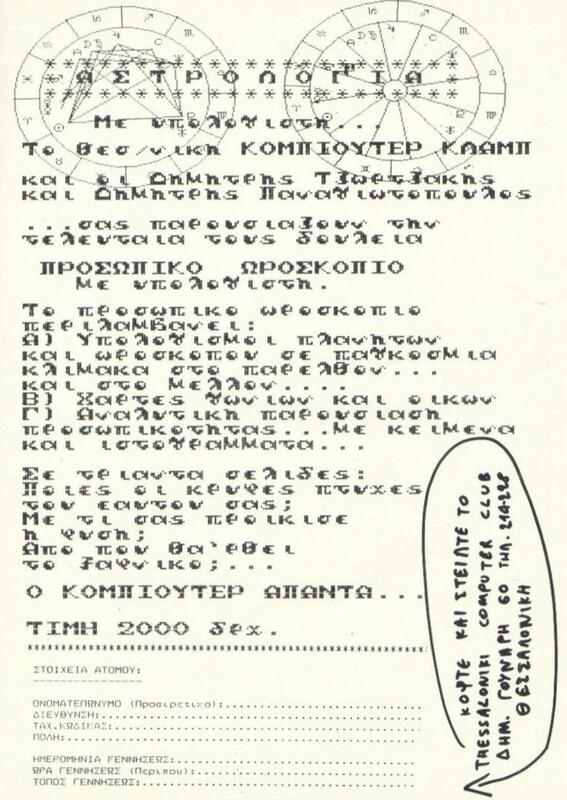 Each package consisted of 3 cassettes and a short manual that the first page bears the signatures of the two developers, Mr. Mark Koutras and Mr. Stefanos Tsitmidelis. 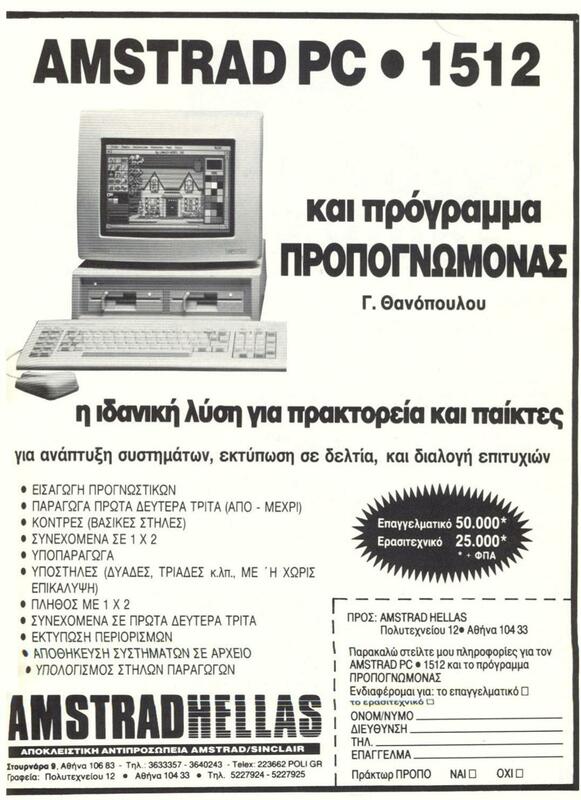 In 1992, after many years of significant presence in Greek IT market, and while Commodore Amiga was at the peak of its glory, MEMOX ABEEH declared bankruptcy, suffered and died from the “Greek family business illness”. 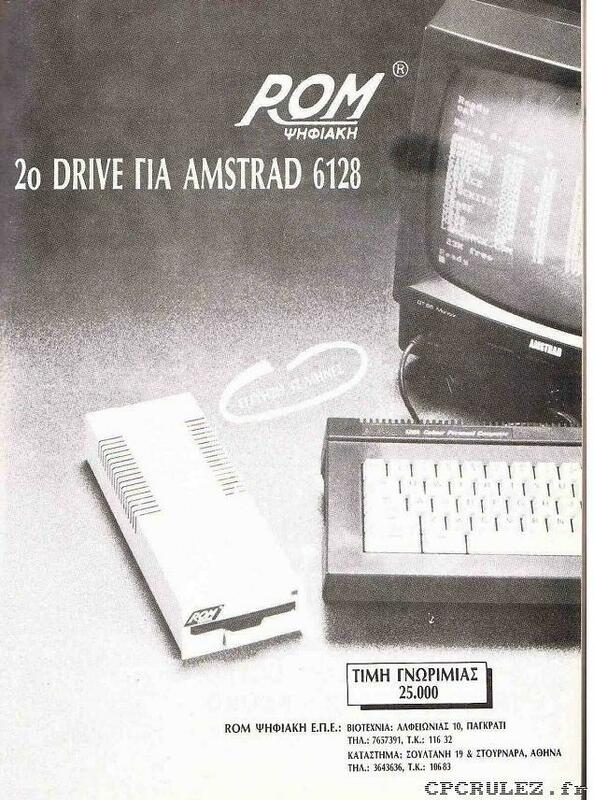 ROM DIGITAL was one of the longest running Greek IT companies. The company’s profile was oriented to the design and manufacture of hardware peripherals for home micros. It had also undertaken the parallel distribution of programs and games of smaller software houses and freelancers. ROM Digital launched its first steps through the Computer Club Shop. It was the target of the implementation of Computer Shop; to make homemade hardware peripherals for the most popular home micros. Apart from support smaller software houses, ROM DIGITAL developed through its subsidiary ROMSOFT its own programs and games. 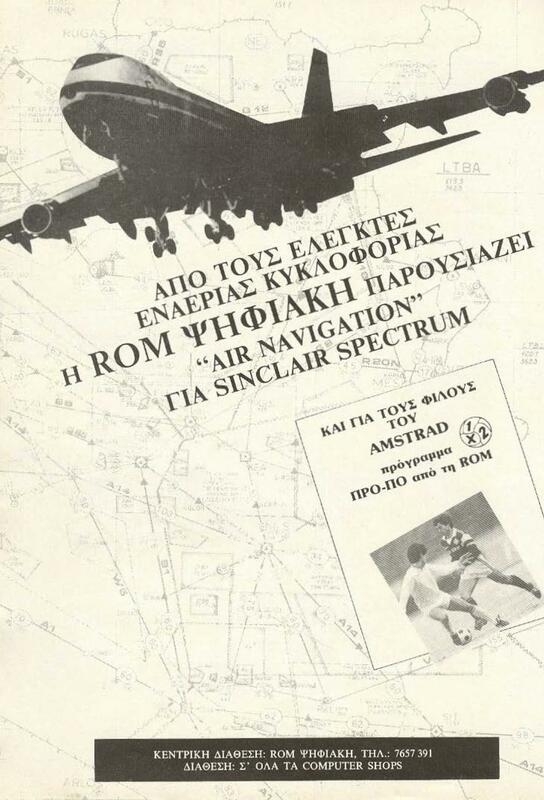 Finally a valuable and innovative (for its time) program developed by ROM Digital (ROMSOFT) is “AIR NAVIGATION”. “AIR NAVIGATION” was not a flight simulator as you would expect to see but a navigation emulator. The program was developed by the valuable advice of air traffic controllers and contained all of identified features in the Greek area. The game starts by asking us some technical data that we have to fill up with the help of the manual (airport coordinates and flights, weather conditions, etc…). Its purpose is to introduce the player to the secrets and technical conditions of navigation. Another software house where the distribution of its programs had been supported and managed by ROM-Digital is Lavirintos Software (Lavirintos = Labyrinth / maze). Lavirintos became known to Greek 8bit world for two remarkable programs developed for Amstrad CPC, the “A-BASE” and the programming language “Label Basic”. A-Base is an archiving program for any kind of data with many amenities, large capacity and processing speed (Random Access). The end user could create a file and define a number of records and field names. The program’s great superiority for that era was the definition of arithmetic operations between fields. For example, any user could very easily design a payroll accounting program or a calculation of income and expenditure. You can consider such features included to large databases for PCs such as dBase IV. 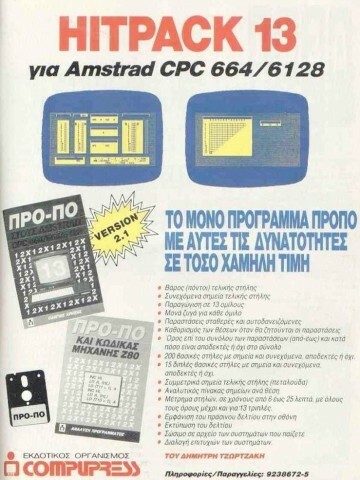 Another remarkable achievement of Lavirintos Software was to create a program development environment, the programming language LABEL BASIC for Amstrad CPC series of home computers. The user could use any external text editor capable to store ASCII characters, or select the editor within the program. Label Basic was also equipped with a converter-compiler (which is the basic program) to convert programs from label format into Locomotive Basic and vice versa. 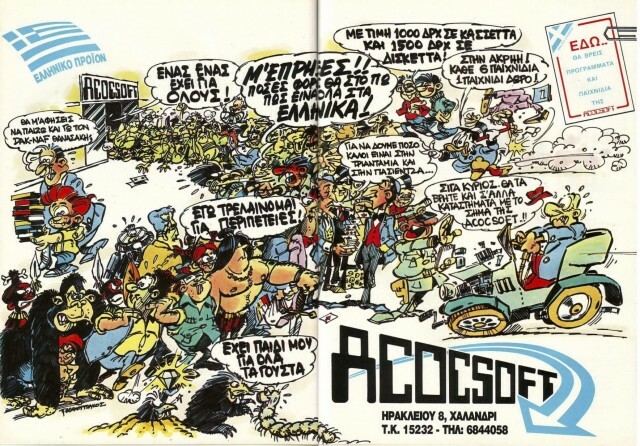 Beyond the eminently Greek software houses and a few computer shops selling their own homebrew / custom made programs, we had also witnessed some timid attempts from a couple of computer press publishers who undertook the disposal of Greek freelancer programmers. 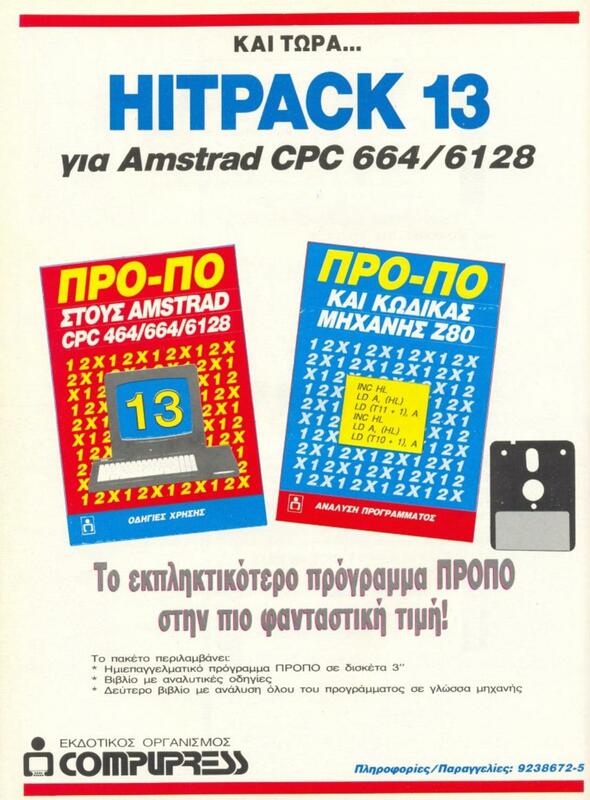 Compupress had a remarkable and great success by publishing “HITPACK 13” by Dimitris Tzortzakis for Amstrad CPC with FDD. It was a betting program based on soccer odds and scores. The program was launched in September, 1987 and had a great advantage that made it very fast; it was written entirely in Z80 machine code. According to developer’s desire (and his statement of how each lock has its corresponding unlock), this program released completely unlocked and besides of its manual it was accompanied by another book, analyzing its algorithms and machine code programming routines! Its success leaded to next release of its first upgrade (version 2.1) with a significant difference. It could print directly to the “TOTO / lottery” piece of document rather than printer paper. 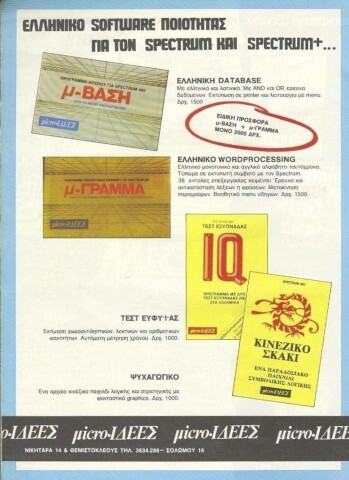 The same success was followed after some time the version for IBM compatibles with the name “E-Dekatriari“. …and secondly “HITPACK 13” was the apple of discord in the courtroom for another program that became a target of piracy. 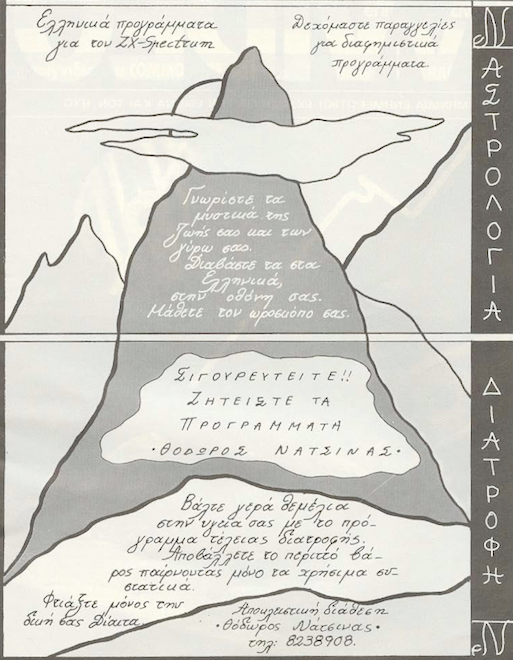 Another publisher who contributed to the spread of Greek software and zealously supported and encouraged independent developers’ creations (freelancers) is Anadrasis Publications (meaning ‘Feedback’ in Greek translation). 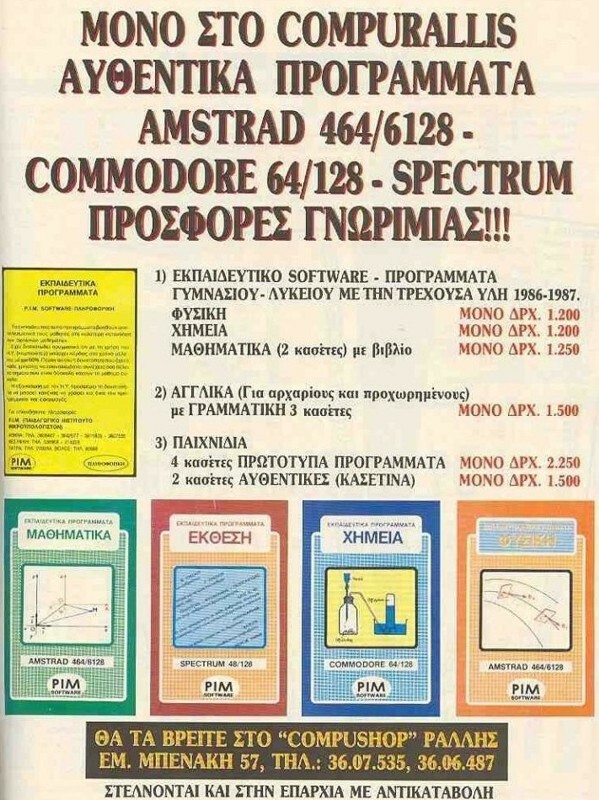 Through its three magazines “The Greek side of Amstrad“, “The Greek side of Personal Computers” and “Sprite“, took over the promotion and sale of independent productions from freelancers developers through the Greek Post Office. 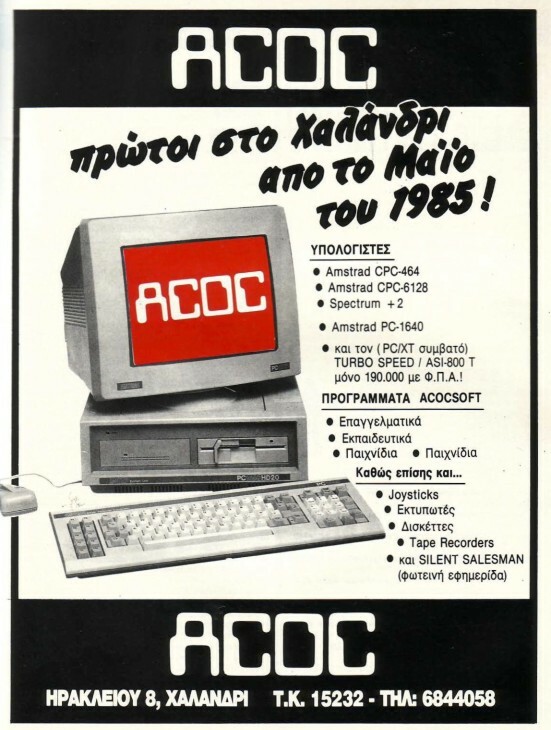 Baud O.E was the official national distributor of Acorn BBC and Electron computers, located in Thessaloniki. Their major hit was “LEXEIS” (WORDS), a word processor in Greek language that filled the gap in professional titles in early ‘80s. The user could type in Greek and Latin characters. 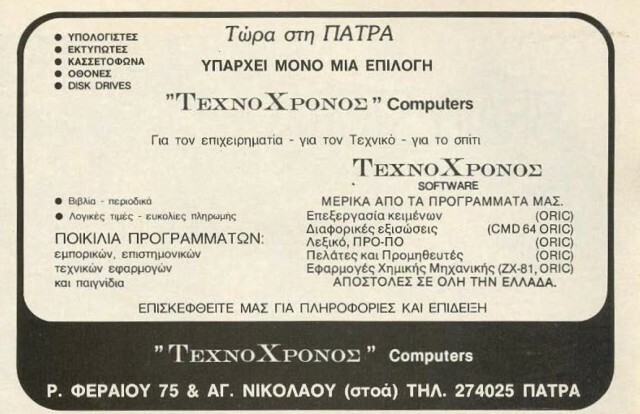 With “LEXEIS” they managed to overcome the obstacle that existed at that time with the Latin word processors, introducing the concept of Greek word processing. 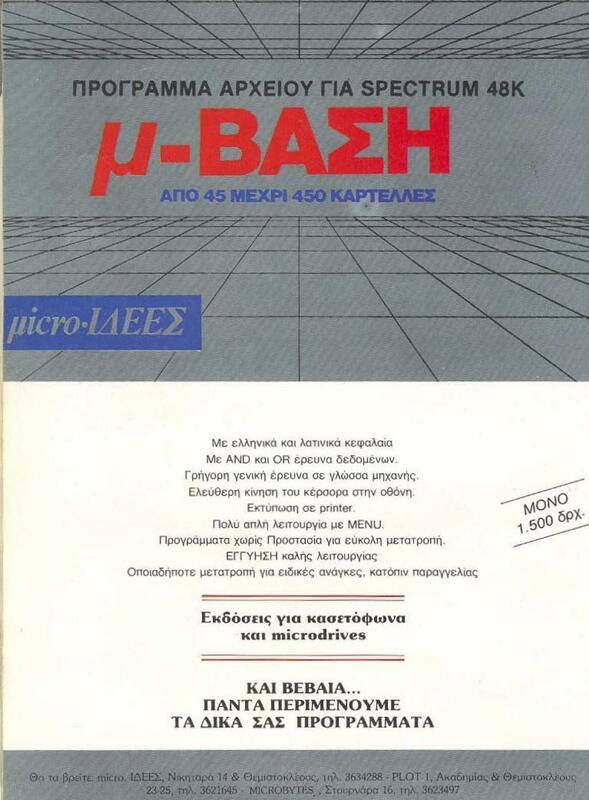 “LEXEIS” was a very well structured in terms of functionality text editor written for BBC model B (and later for other BBC) home computers on the market, not in cartridge form or floppy, but in a rewritable eprom who had to work with a small and easy “operation” inside the motherboard. From the moment you place the eprom inside the computer, the only ingredients needed was a TV set, a cassette recorder (or floppy drive) and a printer. “LEXEIS” accompanied with a brief instruction manual of 40 pages with shortcut keys and a single floppy disc with the drivers for the printer. Despite the fact that “LEXEIS” was an innovative program for its time, it had no impact and success to the public of home users of the time because of its high price. The cost to purchase it was 40.000 drachmas. 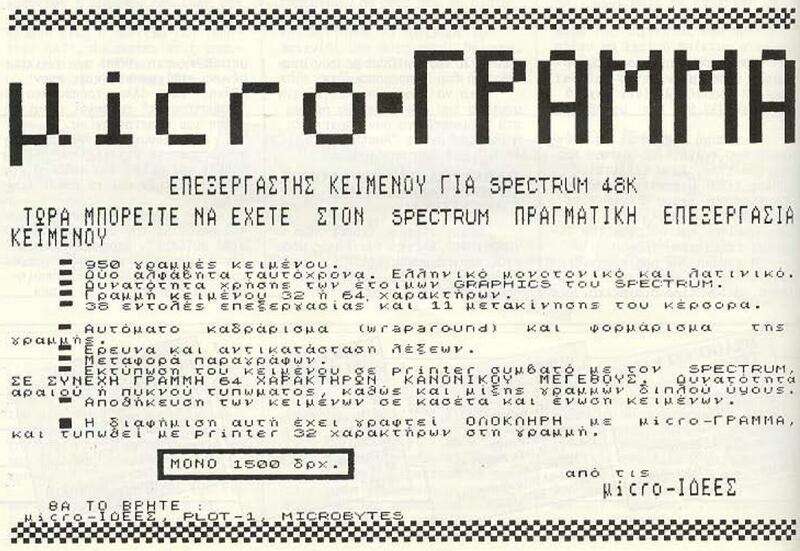 This was a quite high price considering how near the same money was the price to buy a home micro and the Greek word processor for ZX Spectrum “micro-gramma” (m-letters), that released to the Greek market one month later with a cost of only 1500 drachmas. TECHNOCHRONOS was a software house located in city of Patra. 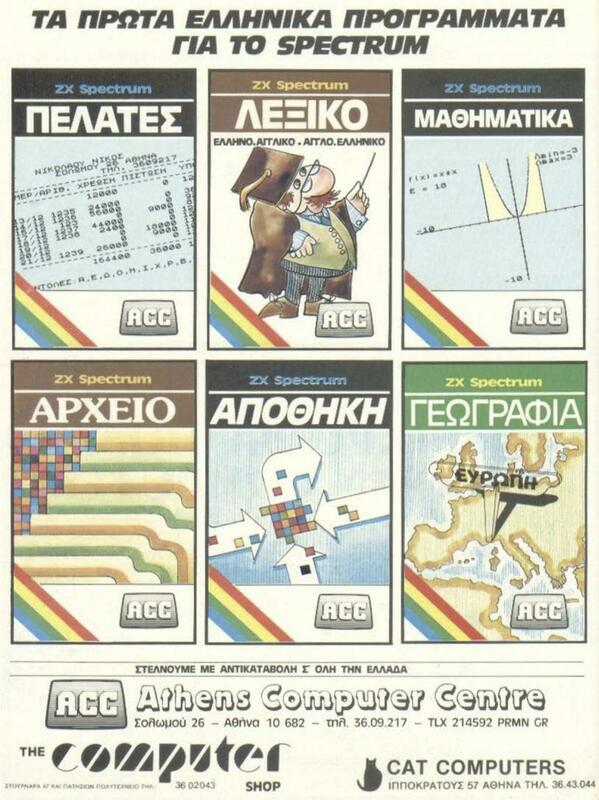 Their goal was to support Oric computers with Greek software titles. 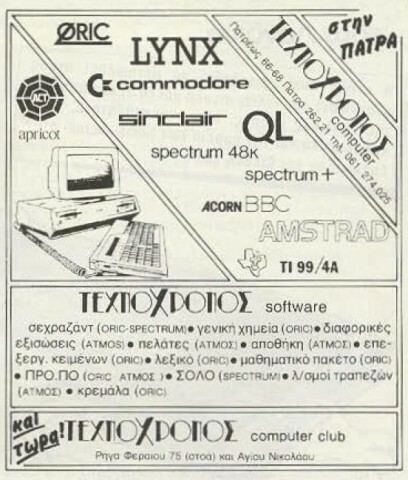 In its development process, TECHNOCHRONOS dealt with applications and games for the best selling computers as ZX-Spectrum and Amstrad. Something which characterizes TECHNOCHRONOS is that their programs were meticulous in every detail, with beta-testing and therefore bugs free! …self acknowledge it except from the manufacturers themselves and from their customers as well! 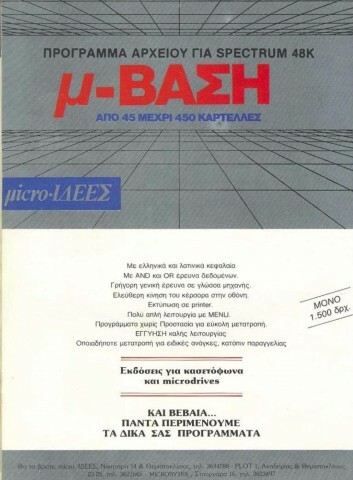 Micro-IDEES was another successful software house in the Greek software market, not so much for the variety or quantity of its programs but thanks to the quality and innovation of applications in home micros. 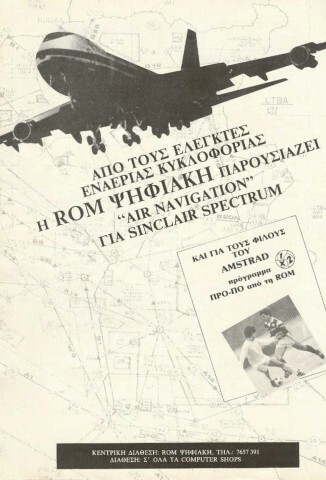 The development platforms were the popular Sinclair computers (Spectrum and QL) and the company’s strategic target was to make a more serious and professional profile of them. The most successful applications they developed were “m-Letter” and “m-Base“. “m-Letter” met huge commercial success as the best text editor for ZX-Spectrum, that Micro-IDEES ported it later for AMSTRAD 464 computer. Another hit of Micro-IDEES which enjoyed great success is the “m-BASE“. It was a data-base type of software which owes its popularity to processing speed, browsing and exchanging data quickly within cards. This was achieved thanks to the machine language code routines the program was assembled from. 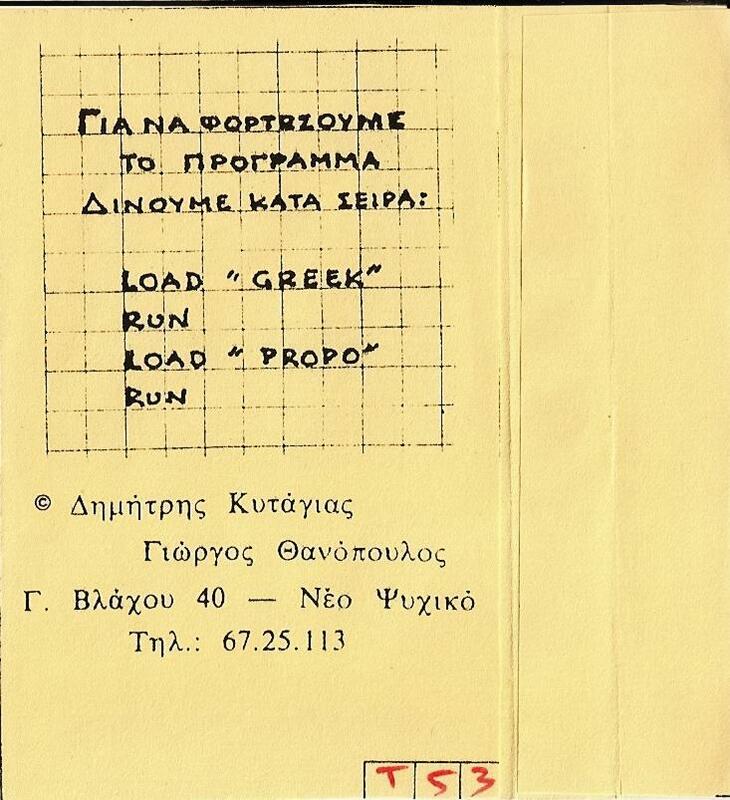 This was the most professional application that was developed in Greece in 1984, for two reasons. First, because it could be used as a phone book, address book, etc., and the second because the company provided full warranty and support for the program. These were two real innovative factors for that time. With the great lack of software that existed for QL computers, a serious accounting package was sought after the Greek market. Micro-IDEES filled that gap by releasing “HERMES” which met great commercial success. Micro-IDEES was not limited to “serious” applications, while developed an IQ test with word-numbers concept as well as a game with beautiful graphics and barely based on the ancient game of Chinese chess. These two programs may not have the success of the other “professional” applications but were both remarkable efforts. Developing in-house programs and applications was an “in fashion”, very common attitude for most Greek computer shops of the era of ‘80s. 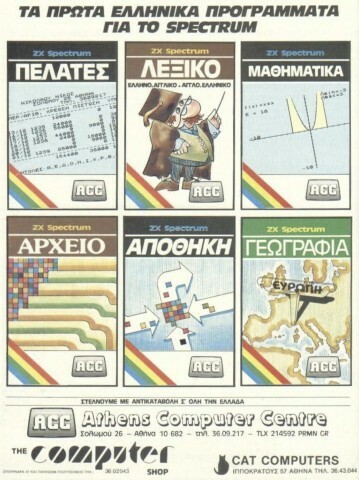 Athens Computer Centre (ACC Shop) created a series of commercial applications and a series of educational programs and learning aids for the ZX Spectrum 48k. 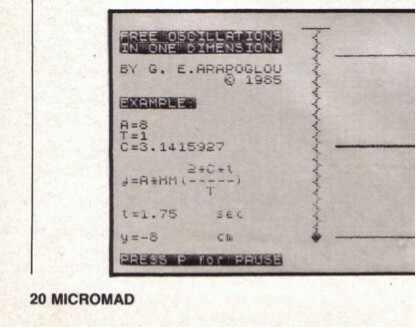 Micropolis (AEBE) was inspired by Mr. Karaiosifidis, a qualified Civil Engineer and programmer and founded in 1983 by himself and Mr. G. Faldamis. He started developing 1Kb programs in Oric computers, addressed to engineers. He strongly believed that software only wasn’t enough, particularly when directed at computer beginners, students and apprentice engineers. Micropolis had two main strategic pillars. The first was “integrated IT solutions” meaning selling software together with hardware so the machine will be «ready to use». The second is the location that the company installed. It was close to National Technical University of Athens, a key advantage to attract young students and engineers. Micropolis was the first computer shop in Stournari street, the Greek Silicon Valley as we mark up till our days. It was the forefront which followed by other stores that moved at that point. 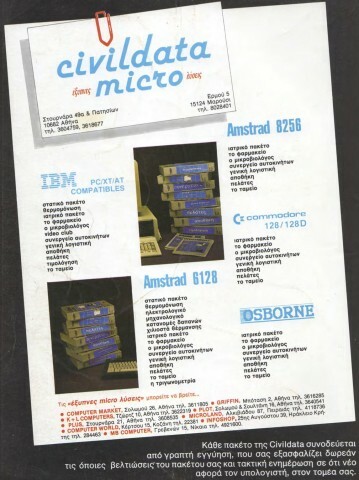 Micropolis except making and selling programs for engineers, has developed educational programs for AMSTRAD computers and ZX SPECTRUM. They were based strictly on material of textbooks of that era. Maybe that arose the main excuse for many kids to ask their parents to purchase home computers in order to help them to their school home work! 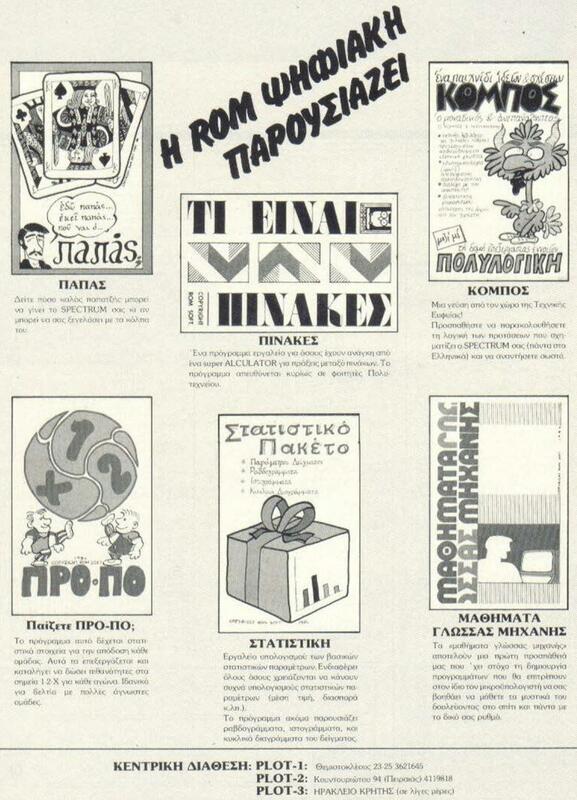 The lead programmer of these educational aids was Mr. T.Fousekis. 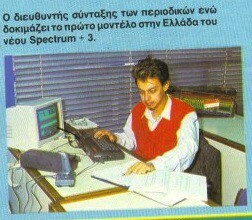 For ORIC computer educational aids, lead programmer and main responsible was Mr. E. Liberopoulos. All the educational programs faithfully and hierarchically followed the school curricula classes for Gymnasium / Lyceum. 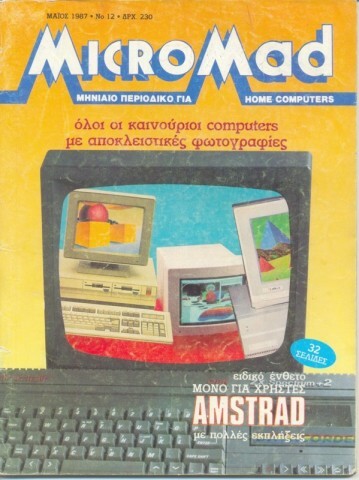 Apart being a software house and computer shop, for Mr. Karaiosifidis ‘Micropolis‘ was the key to obtain the representation of Amstrad in Greece and become a publisher in 3 computers magazines: “World of AMSTRAD“, “Micro Mad” and “Informatics & Computer“. From the oldest import companies, distribution and sale of computers, with activities in the field of Greek software, Civildata had to demonstrate a wide range of commercial applications for popular home micros; Amstrad and Commodore and for Personal Computers as well. 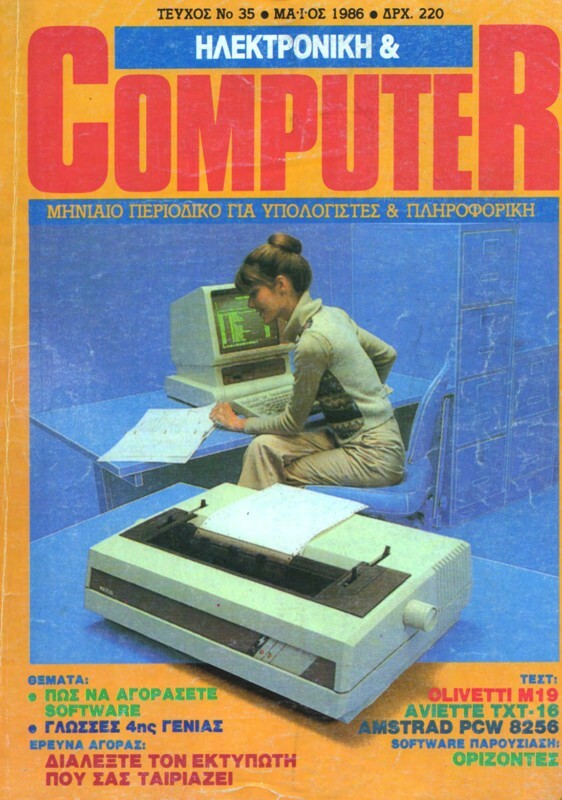 It started off with focus on complete solutions for engineers and accounting departments and arranged to fill a market gap by supplying with Greek software the first laptop computer ever made, the great OSBORNE-1. Rainbow Computers was another company that found its peak in the decades of ‘80s and ‘90s because of the official representation of Apple’s products. It had supported Apple computers and Macintosh series with an autonomous service, showing great sensitivity in the Greek software development for Apple computers and MACs. It presented a series of educational programs for those computers. 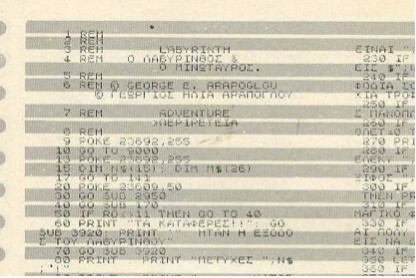 A sample of these programs is the “Ancient Greek” for Apple II and “The Reading Express” an original reading speed exercise program. Apart from software houses in ‘80s there were independent productions from developers who had passion for programming and they were not supported by either a company or from any of publishers. Such a successful application is “PROPOGNOMONAS” of Mr. Dimitris Kytagias and Mr. George Thanopoulos. “PROPOGNOMONAS” is an editor and development of ‘PRO-PO’, a TOTO / LOTTO betting type of game based on soccer odds. This was released for Commodore 64 /128 and for AMSTRAD PC-1512. The program came in 3 versions. 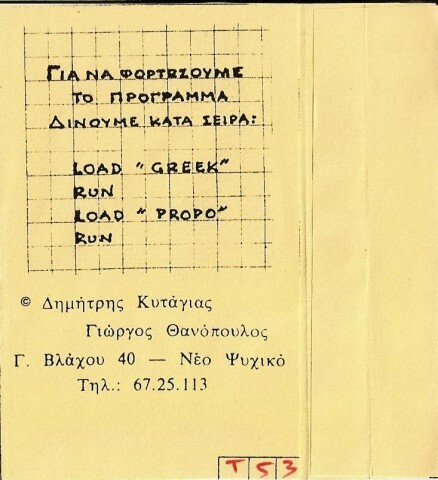 Another “PRO-PO” type of program was “1-2-X Lucky Player” written for Apple computers IIc, IIe and IIGS by Mr. Alexander Giatzidi. There were many other remarkable efforts of independent developers with releases around / based on state gambling, astrology, data bases and other titles of lower marketability. All these titles had one thing in common; the passion of their developers. Independent productions resulted additionally from computer clubs founded in various areas of our country. 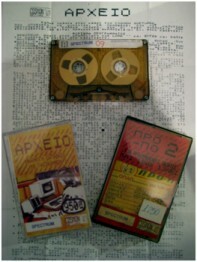 Such examples are both Thessaloniki Computer Center and also Athens Computer Club with their releases “Greek d-BASE” and “English in Action” respectively. 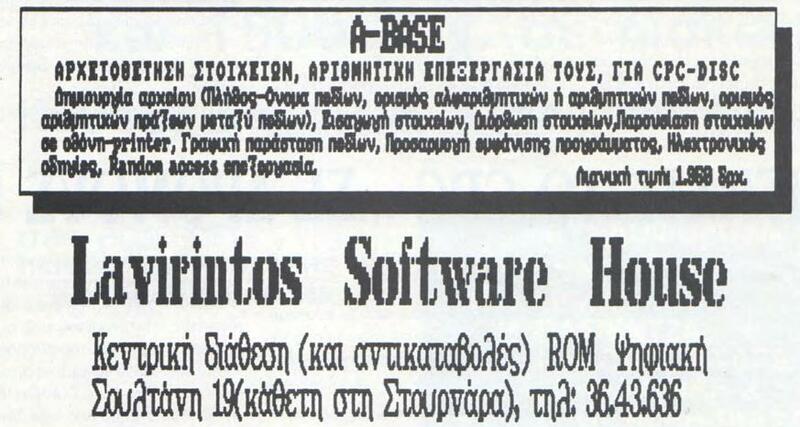 We could say that Greek software houses jumped out from the frying pan and into the fire in 80s and 90s because of the difficulties encountered in the Greek market of IT. There were lot of reasons with the main cause underlies the fierce competition from foreign software houses. 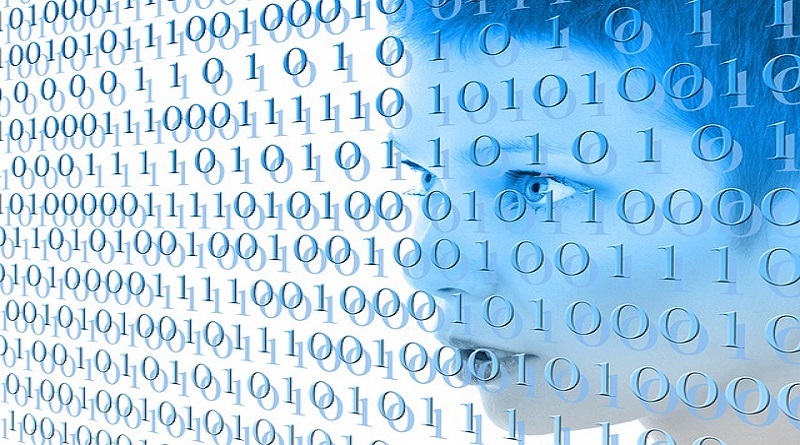 Greek software houses lacked to foreign from technical infrastructure. They were planning and materializing each game directly on their respective computer (C64, Amstrad, Spectrum and Amiga). Each programmer was obliged to be in direct physical contact with the rest of the group. Each member of the developing team had to exchange his work with others in the same working space, at the same time so to avoid possible bugs or program “hangs”. This was the mandatory procedure of developing and debugging phase of each program or game. In major foreign software houses, each member of developing team was connected to a network and most of programming was doing in mainframes and mini computers such as VAX (through emulation of the respective processor). Debugging check in final stages was a very easy and flexible process. Their main programming tool was assembly language or machine code, against the much slower basic that was widespread used by Greek software houses. 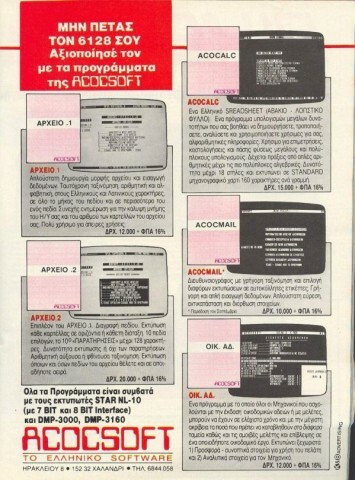 Another difficulty encountered by the Greek software houses was the lack of support from foreign computer press. 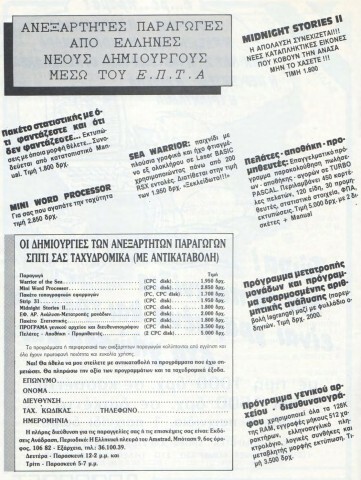 Internationally renowned magazines such as “Byte“, with a more than average sales rate in Greece, did not only make a review but was even unaware of Greek software existence. On the other hand, the support from domestic press was inadequate. That is the reason we know them only by their ads and from a handful of reviews of some very distinguished games. We have to mention also the factor of local competition between Greek publishers (who consisted also software houses), avoiding to advertise their competitors products. Support from the majority of computer shops was not encouraging either. They used to avoid and distrust Greek software and their associated software houses. A typical example of that was the fact that companies like Acocsoft and Cosmon, in their first year of existence were taking orders by phone or snail mail, distributing their products to clients in a ‘door to door’ basis by their own employees. 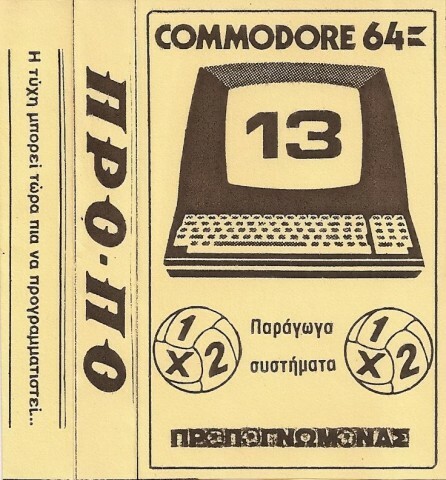 The final thorn for the Greek software houses was of course software piracy that was very widely spread among users and shops all over the country. Foreign houses were using sophisticated locks, hard to get cracked by an ordinary user, such as Speedlock or Amskey (for Amstrad home computer), while for Greeks the simple protection of basic language was sufficient or sometimes non existence (open source code commercial releases). The decline of home computers market in early ’90s accompanied the sunset of Greek software houses which developed games and applications for these computers. Some companies like Cosmon, tried to make a leap to the PC platform without any real success, so they reached to their end as well. Unfortunately neither Commodore Amiga, nor Atari ST the only home micros that survived in ’90s, could motivate the Greek software houses to stay alive and develop for them. 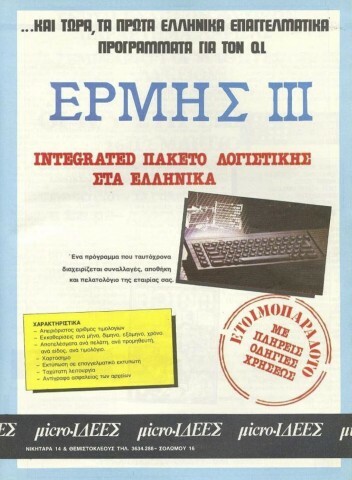 For Greek speaking readers, there is also an excellent thread here with some extra info about Greek Software Houses, mainly focused on more professional systems at the time like IBM PCs and compatibles. Που τα θυμάσαι ρε θηρίο μπράβο!!! Να επισημάνω οτι το άρθρο ξεκίνησε έπειτα απο παρότρυνση του φίλου μου Γιώργου (Geonanas) τον οποίο υπερευχαριστώ για την καταπληκτικη δουλειά στο ρετουσάρισμα και στην μετάφραση ακόμα και των τεχνικών όρων. Σ’ευχαριστώ πολύ GEO!!!! 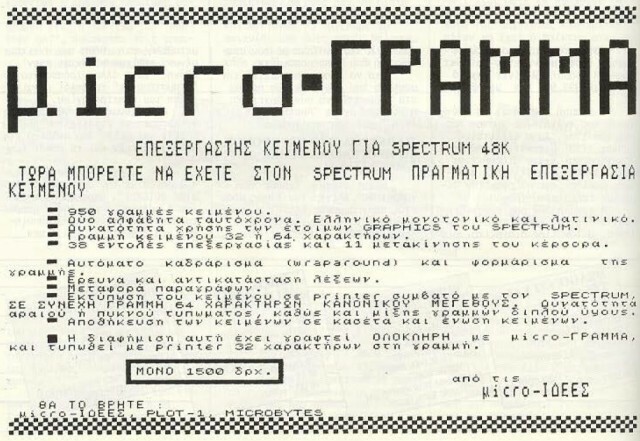 Το άρθρο αναφέρεται μονο στο κομμάτι των home micros και απέφυγα να κάνω αναφορά σε PC software houses όπως Singular, Computer Logic, Technosoft κ.α. λόγω του οτι θα ήταν ένα ξεχωριστό κομμάτι μόνες τους.